My family just returned from a too-short visit to the beautiful northwest. We hung out in Spokane, WA, and Coeur d’Alene, ID, for a week… seeing friends, tracking down old haunts, and visiting places and activities mentioned in my Rhythms & Muse novel. One lazy afternoon, we strolled the Centennial Trail through the City Park, soaking in sights like this one. But what’s so uber cool about this…? Downtown Coeur d’Alene is just about two blocks to the east of this scene. Can you see why lovely Lake Cd’A certainly served as high inspiration for a major portion of my novel? Who wouldn’t want to spend time near this blue water? Do you have a Cd’A story or photo to share? Comment below, or send your .jpg image to me at avidean@videanunlimited.com and I’ll post it in a future blog. 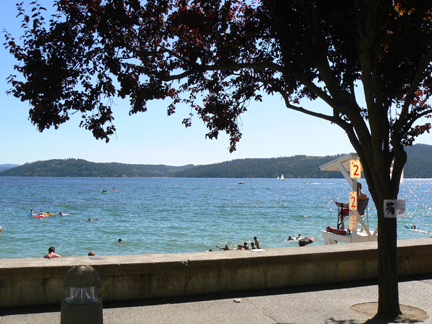 This entry was posted in All Posts, Coeur d'Alene, ID, Rhythms & Muse novel, Words: Serious Play and tagged Ann Narcisian Videan, Ann Videan, Cd'A, City Beach, City Park, downtown beach, Lake Coeur d'Alene, Rhythms & Muse, Videan by Ann Videan. Bookmark the permalink.